SIP or systematic investment plan has multiple advantages and it is one of the preferred methods of investing for Indian retail investors. Habit of Regular Investing – Helps in building wealth by making investment a habit. It is tough for some people to invest large money in one go but isn’t so tough to be investing a small amount every month. Slowly over time, capital invested increases and investor develops a habit of investing. Rupee cost averaging – Rupee cost averaging or RCA is one of the biggest advantage of SIP investor. Investor ends up buying more units when markets go down and fewer units when the market goes up which nullifies the ups and downs of the market. As more units are bought for the same price when market was down, it pays off many folds when market rises. Compounding effect – As the time given to investment increases, the wealth accumulates at an accelerated pace because of compounding effect and higher corpus is accumulated at the end of the tenor. Clearly, it is one of the better methods of investing in equity markets but what one should do when he or she has a large chunk of money lying in the bank account? When your view is 10+ years, markets are never down for such a long period of time. In the history of mutual funds, there has never been a 10 year period when mutual funds have given a negative return. In fact, mutual funds outperform in the long run making the lump sum investment a better choice. The biggest advantage of lump sum investment is, more money remains invested in the market for a longer period of time providing more equity exposure to beat returns from SIP method. Let us see how a SIP of ₹10,000 for 35 months when compared to lumpsum investment of ₹3.5L 1st March 2014 pans out. 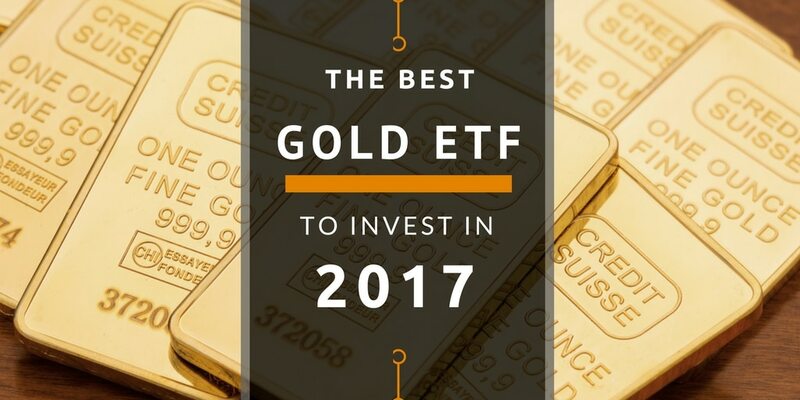 Let us select one of the best large cap fund of 2017 for comparison. 12% compounded annual growth rate or CAGR for SIP investment and compare that to a lump sum and it provides close to 20%. Now let us see similar investment for the best midcap fund of 2017. Again lump sum investment outperforms by 31% CAGR when compared to only 20% CAGR in SIP and corpus of 8L when it is under 5L in SIP. There are 2 main reasons for the lump sum investment to outperform. The first being the most basic which is more amount of money is exposed to equity investment for a longer period of time giving much better returns. What I mean is at the end of the first year, only 1.2L is invested in equity for SIP investor. Compare that to a lump sum and it has its full corpus exposed to equity which allows the lump sum investor to outperform. The second important factor for such an outperformance is the market. It has gone up quite a bit from the investment date of 1st March 2014. So let us make the investment date as 2nd March 2015 instead of 1st March 2014. 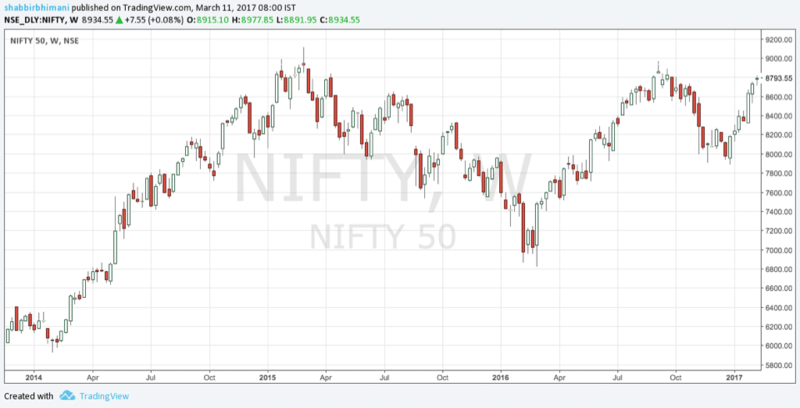 2nd March 2015 is when Nifty hits its peak of 9119. Clearly SIP outperforms in both large cap and midcap funds. When market is going up, lump sum outperforms SIP returns. 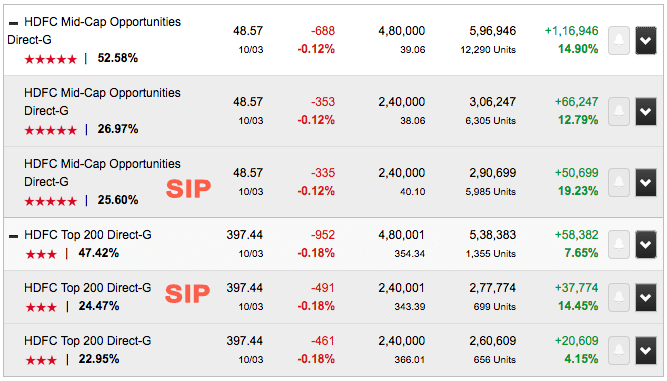 When market is sideways, SIP returns outperforms lump sum investment. I am not here to compare SIP Vs lump sum investment and conclude what works and what doesn’t. We are investors and would like to take the best of both methods of investing to build wealth. In a large cap fund, we invested a lump sum amount at the market peak. As of today 12th March 2017, we are yet to cross that peak in Nifty but the fund is giving more than 4% CAGR tax-free returns. Adding SIP to the same fund, the returns are above 7% CAGR. Shorter time duration with flat market and invested in a large-cap fund with large part of our investment at the peak of the market and yet we managed a 7.5% CAGR when we split the investment into SIP and lump sum investment. Applying the same to a midcap fund return is 12% CAGR to lump sum investment and with a SIP, the returns are close to 15% CAGR. So if you have an option to invest a lump sum and has a long-term view, it is always advisable to let the money remain invested in an equity fund. 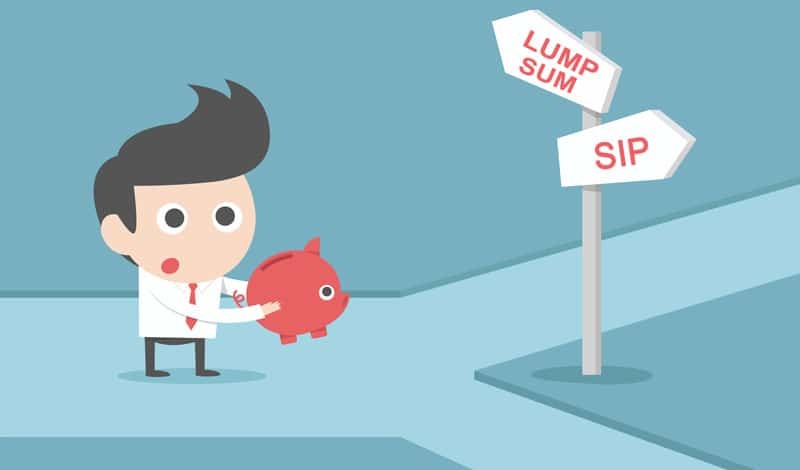 For lump sum investment, the best an investor can do is split the amount in 3 to 4 tranches over a period of 6 months or create a large SIP for 6 months. You are here: Home / Financial Glossary / SIP or Lump Sum – Which Is Better Investment in Mutual Fund For 10 Years?